Treat Mom to a unique pre-Mother's Day Event this Saturday, May 12th! "Mother knows best..." That's why this Mother's Day you should show her how much you care by giving her a gift that will last all summer...a Hobie Kayak, a Standup Paddleboard (SUP), or even a year of unlimited boating with a Quest Express membership. Each is guaranteed to put a smile on her face - and yours! Mom would never let you buy a pair of pants without trying them on, nor would she let you buy a car without a test drive...so why should a Hobie, SUP or boating membership be any different? Here's your (her!) chance to try one...It's FUN & FREE! Or let the family see & touch Quest Express club boats. Experience what affordable, hassle-free, unlimited boating can be...then go for a quick ride before you sign up!! All new memberships during Mother's Day weekend include a FREE TUBE & ROPE for the family!! 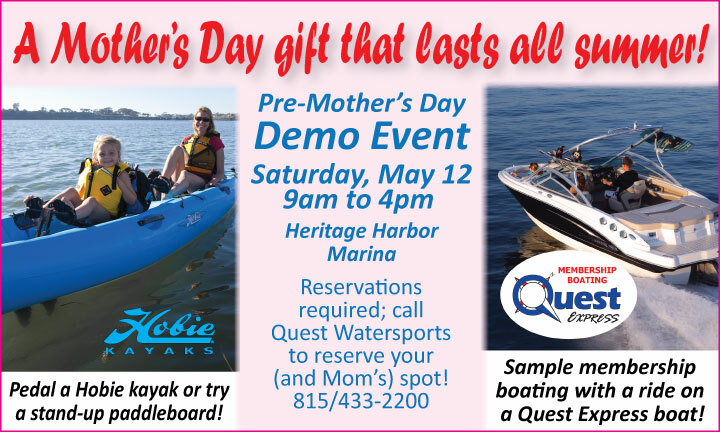 Let Quest Watersports be part of your Mother's Day surprise! Plan the day at Heritage Harbor Ottawa – try any or all of these exciting watersports (no obligation to buy! ), enjoy the spectacular marina setting, and then treat her to lunch or dinner at Tracy's Boathouse! To make your reservation, or if you have any questions, please call Linda at 815/433-2200, or email linda@questwatersports.com. This Mothers' Day, do something different... flowers are nice, but treating her to a Hobie kayak, standup paddleboard, or a summer of unlimited boating would be even better! *NOTE: Expect to get WET on the kayaks or paddleboards. You can board them from a dock or at the water's edge, and you should wear shoes or sandals that can go in the water. We also recommend wearing synthetic clothing or a bathing suit that dries quickly. Unlimited Boating at Heritage Harbor…without Owning a Boat! Imagine…your choice of premium boats, whenever you like. Better yet…NO boat loan, NO maintenance expense or hassle, and NO storage or trailering. Just choose a boat online, pick a time to go boating, and that boat will be ready & waiting for you at the marina. Try some tubing or wakeboarding behind a nimble sport boat…or perhaps a relaxing cruise on a luxury pontoon. Bring your friends & family, enjoy a spectacular day on the water, and then drop the boat off when you’re done. All fun, no fuss…then do it again next time, all summer long! It’s like having your own fleet of boats…and a personal butler to take care of the details! 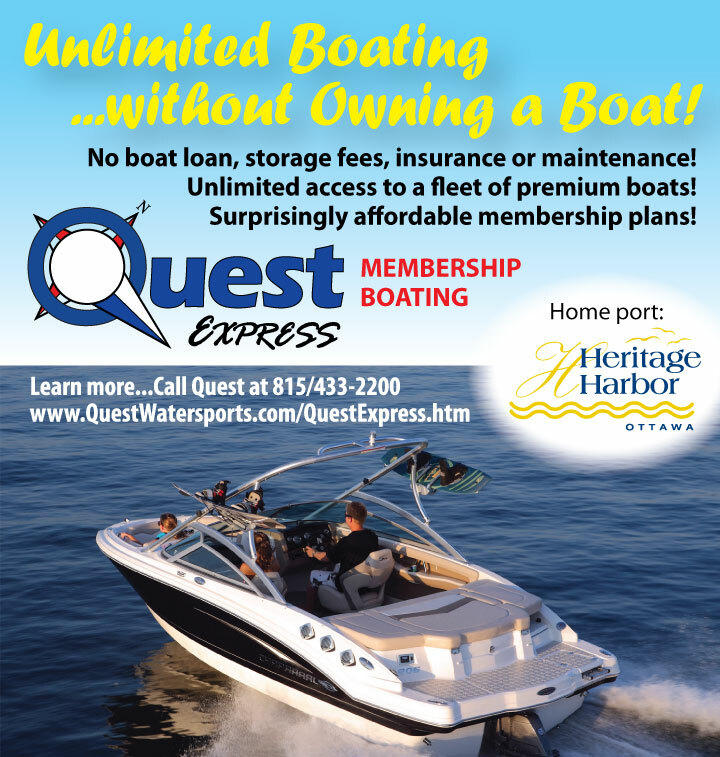 It’s all possible when you join Quest Express, a membership boating club based at Heritage Harbor Ottawa. Surprisingly affordable membership plans are offered, and lessons are available if needed. Quest Express Boat Club...it's the newest, easiest and most affordable way to boat! Enjoy...Unlimited boat usage for a low annual membership fee; 24-hour online reservation system; Freedom to entertain family, friends or clients; No boat loan, slip/storage fees, insurance or maintenance costs; No per-use charge; pay only for the fuel you use. 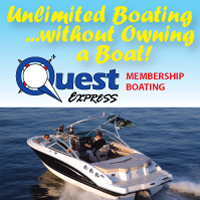 Learn more about Quest Express membership boating…call Quest Watersports at 815/433-2200.